The Annual Macon Co. Lincoln Dinner will be held Thursday, March 19, 2009 at the Pear Tree Restaurant in Bevier. Doors will open at 6 P.M. and the dinner will begin promptly at 6:30 P.M. The event is the premier event for the local GOP in both attendance and fundraising. Ticket price is $30 per person and includes drink, salad, onion rings, prime rib, shrimp, or chicken, starch, dessert and tip. Sponsor opportunities are included in personal invitations that will be mailed within this week. Last year, 141 attended the record-breaking event. Sen. Kevin Engler, R-Farmington will be the featured speaker. 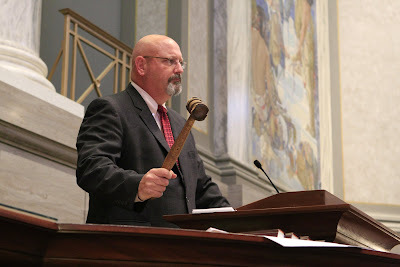 Engler was elected to the Missouri Senate in 2004 and serves as the Majority Leader. He also represents the bluest district held by a Republican in the state. RSVP’s are welcome to Jane Thompson, Treasurer. 1103 E Briggs, Macon, MO 63552, (660) 395-9707 or jane@olaughlininc.com.